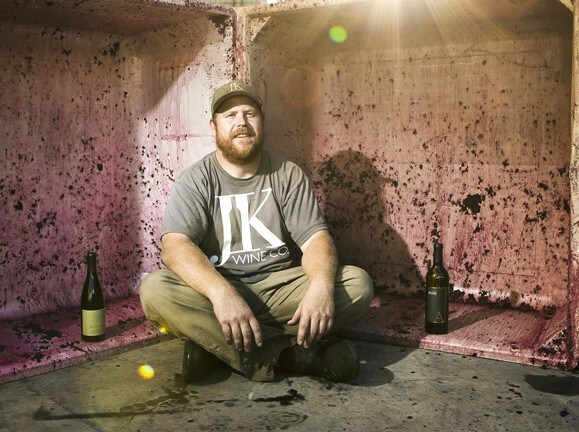 JUST CALL HIM JK : Justin Kahler’s first name might not be unique, but his approach to winemaking is. When winemaker Justin Kahler moved to Paso Robles wine country to create his own brand, he already knew he couldn’t use his name on the label. That brand name was taken long ago by Justin Baldwin, owner of Justin Vineyards. But Kahler chuckled while admitting he’s used to that happening to him. It started when he joined an elementary school baseball team that had nine boys named Justin. The coach gave them all nicknames: Kahler’s was JK, and the letters seem to have stuck with him for life. It makes sense that he uses his initials for his business name, JK Wine Company, but that’s not the name prominently featured on his wine labels. Kahler makes two brands, Katin and Arada. The first, a combination of his wife’s and his name, was something Katie Kahler happened to write down while doodling, and he said he liked the sound of it. Katin is devoted to Rhone varieties. The other label, Arada, is a Spanish term meaning “plow the ground.” That’s what the Franciscan Padres called the plow they used to plant vineyards in the late 1700s. Arada features single vineyard Cabernets, Cabernet blends, and Albarino. Meeting Kahler for the first time, I was impressed by his philosophy: “Our mission is to create wines of unequalled elegance and quality.” I could taste it in Kahler’s offerings, which he discussed with me while we sniffed and sipped through his impressive current releases. His Arada 2008 Albarino Edna Valley, grown at Jack Ranch Vineyard, is elegant and beautifully balanced. The delicious Katin 2008 Viognier, grown in the cooler Templeton Gap, comes from the Valhalla 5-acre vineyard formerly farmed by Rhone wine legend John Alban. Kahler said: “The Templeton Gap is the sweet spot for white wine; it’s all about balance and elegance.” He also prevented malolactic fermentation in the Viognier to retain its natural acidity and balance. It’s still said that it takes more than passion to make your wines stand apart from the rest. But that better describes oenophiles than Kahler, who can boast an impressive résumé. He left to attend Fresno State where he had a triple major: chemistry, enology, and viticulture. “We made 26 varieties and 15,000 cases of wines,” he said. He stayed in touch with 15 other winemakers in his classes; all of them, he noted, are working on the West Coast, from Oregon’s Willamette Valley to Santa Barbara County. He had also established friendships with salespeople working for the prestigious Henry Wine Group, who turned him on to many more exclusive wines. STOP IN FOR A SIP: Find JK Wine Co. wines in the Meritage Wine Tasting Lounge at 810 11th St. in Paso Robles. For more information, call 226-7514 or visit jkwinecompany.com. During our tasting, it came as a complete surprise when Kahler said his day job is wine grower for Michaud Wine Company of Monterey County. The grapes are grown in the famed Chalone region, near Soledad, where Michael Michaud worked several years before planting his 28-acre vineyard there. In 2007, a Fresno classmate introduced Kahler to Michaud. They use their own equipment, only leasing space. Kahler manages everything, from the vineyard crew to the winemaking, and makes his wines there. “The great thing about Michael is the focus on balance and acidity. Michaud is primarily focused on Burgundy, so I’m working with a good cross section of varieties,” Kahler noted happily. There are three Katin 2007 Syrahs, each a unique wine expressing the distinctive vineyard where it was grown: Del Rio in Oregon’s Rogue Valley; Michaud in Monterey County’s Chalone; and Glenrose in Paso’s Westside region. The Oregon expressed rich fruit that melded with typical earthy qualities. Michaud Vineyard grows only 1.8 acres of Syrah, with cuttings from Jean Louis Chave in Hermitage, France, and Kahler gets half of it. This beautiful, elegant Syrah had what he called the classic expression of violets and white pepper. Glenrose Vineyard gives him four rows of terraced vines, which Kahler said showcases Paso Robles: “It represents what Syrah is about. We get great spices but it’s more fruit driven.” The most expressive of the three, it offers ripe, rich flavors without being out of balance. Reach New Times’ Cuisine columnist at khardesty@newtimesslo.com.